The 2015 Munich Practicum (The XIX European Practicum) | CPX International Inc. 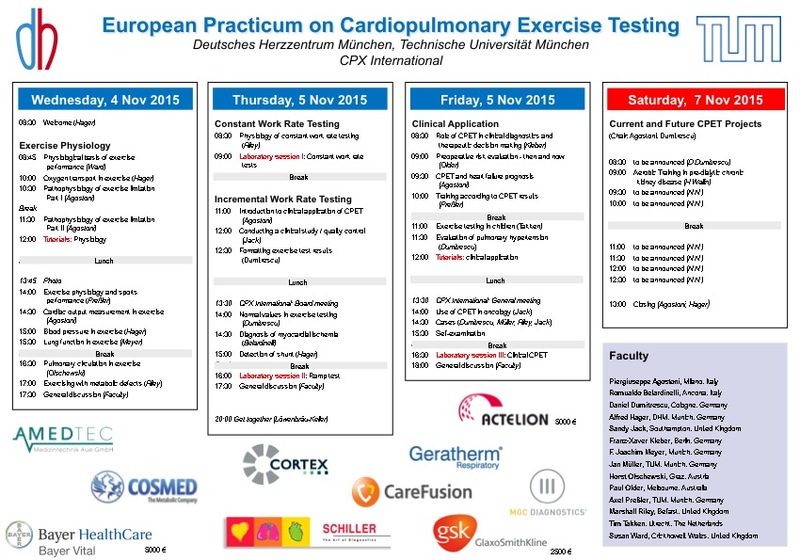 The 2015 „European Practicum on Cardiopulmonary exercise testing“ was held in Munich from 4th – 7th November 2015. It was a meeting with slightly more than 100 participants, newbies and experts, from all continents except South America and Antarctica. There was a teaching course on the first three days covering all main topics of CPET. On Wednesday we started with basic exercise physiology. Besides the presentations there was a tutorial, where 10-15 participants could ask questions to one tutor from the faculty. On Thursday there was our “how to do” day. Different protocols and a standard report were presented. In two practical sessions the sponsoring industry could present their metabolic carts during constant work and ramp tests; tutors explained the measurements and their physiological background. On Friday various clinical applications of a CPET were shown. Again in specialized tutorials on different medical fields and in another laboratory session with an exercising patient, the CPET as a diagnostic tool was demonstrated. On Saturday there was a scientific session with abstract presentations of new studies. We heard about new CPET variables, new algorithms how CPET results can be used to guide diagnostics or therapy, and some training studies. It was an exhausting, but very interesting week, and we are looking forward to the next practicum in Milan / Italy from 26th to 28th October 2016. From the perspective of CPX International Inc., this Practicum in Munich was a great sucess due in no small part to the energy of Professor Doctor Hager. Everything ran very well and the venue was excellent. The weather was very cold for those of us who came from Australia but we soon adapted. There were around 100 people enrolled of whom only a small number were German. This says a lot for the sucess of the advertising from Professor Doctor Hager. We received a lot of suggestions on how things could be improved from those attending. We will certainly take note of these and will implement the ideas where possible. For the first time we have included on this page, some of the lectures in .pdf format. These can be accessed via ‘clicking’ on the appropriate link.